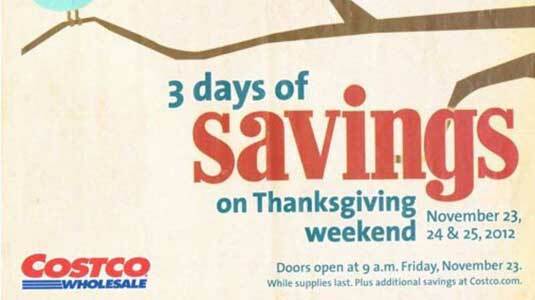 Just received is the 2012 Costco Black Friday Ad. The scan is available for download or viewing at the link above. The coupons run from November 23rd (Black Friday) through Sunday November 25th. The stores open an hour early at 9am on Black Friday, yet a lot of stores black friday hours will be 8:30AM to 8PM. There are only 5 pages of in-store deals, the rest are for online discounts. On the other hand, the regular November 2012 Costco coupon book is still valid over this period, so there are a lot of discounted items. Three pages in is a TV ad that says that there will be instant savings on brand name TVs, but does not give specifics, which is very different. Also of note, Costco will be giving away their annual cookbook, so if you want to pick one up before they’re all gone you should stop by no later than Saturday. Deals of note include $100 off the Samsung Galaxy Tab 2, $40 off a Sony Blu-Ray player, and $120 off the Dyson Animal vac, making it $369. Lastly, I’ve heard rumblings about a 65″ TV with $500 off, and I will update you as I get more information. Read more to see the list of items. Anything that will get you up and in line early Friday morning? What time do the online sales start? Black Friday must be very difficult for Costco with their money back guarantee…..think about it if you bought anything previously that then becomes a BF item you could simply return the previous item and get the BF price…..almost like a price guarante on anything that they carried previously. One of Costco’s key benefits becomes an issue if they wanted to have real BF “Doorbusters”….good news is that they don’t need to really do that, members are there the other 364 days of the year.